To be honest, there are probably more iPad Air cases than you can shake a stick at these days. To stand out, you need to do something special, and Filofax, the veteran brand, has something to contribute to the already overcrowded market. What makes their iPad case different? A lot actually. The fact that they package an iPad in a leather zip up folder helps, with the addition of a Filofax notebook thrown in for good measure. An elastic loop for you pen helps too, and makes sure you have your stylus or pen handy for those important meetings. The target audience is definitely your busy office worker, who ends up attending a lot of meetings, but still needs access to emails and rest of what the iPad has to offer. With the zipper closed, it is like any other leather bound zipped folder. A good textured finish gives it a premium feel, while a great zip means that you don’t need to worry about it getting stuck or broken. Open it up and you are faced with the iPad attachment on the right, and a pocket to store your Filofax notebook on the left. Also included is an elastic loop for your pen. With all things in, i.e. the iPad and the Notebook, it works pretty well, and zips up quite easily, without feeling bulky. Weight wise, it is a bit on the heavier side, but in a ‘premium’ kind of way rather than with a bulky feel. 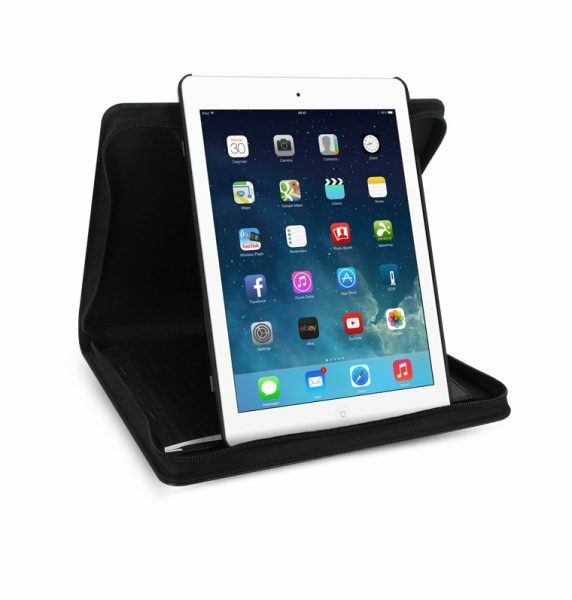 The iPad simply snaps into the case, inside the plastic shell that is mounted on a 360 degree mount. Removing it is similar, just bend the plastic to pop it out. Once in, the ports and the buttons are all exposed, so you don’t have any issues. In the case, the iPad can be used in any form possible. This includes having it portrait or landscape mode for watching moves, writing emails, browsing, or whatever takes your fancy. It can also be left as it is for normal usage. 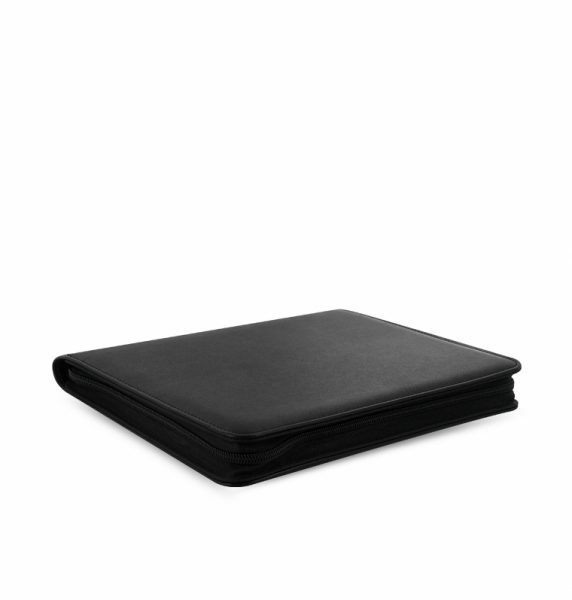 No leather folder is complete without a notebook, and the Filofax notebook fulfils that role pretty well. Not much to add to that, apart from the fact that you have the perfect notebook for your meetings. Perhaps one that offers a Bluetooth keyboard option would be good, though I like what Filofax are doing, i.e. sticking to what they are good at. More information on this can be found at the Filofax website. It retails for £35 and can be bought directly off the website. It comes in black, raspberry and cobalt blue colours. 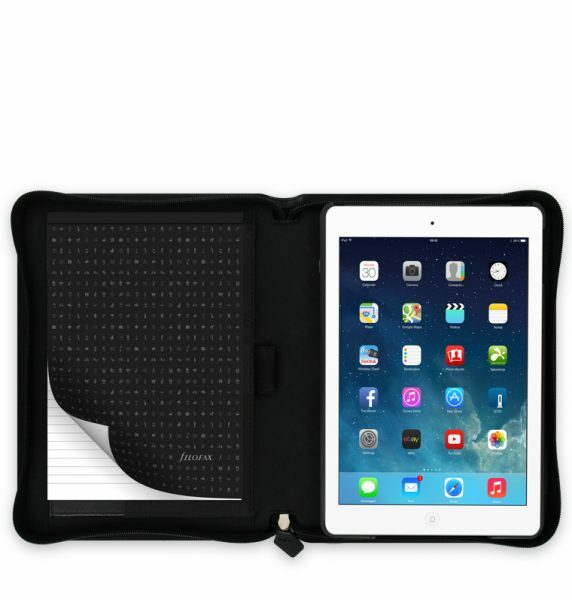 If you fancy a good premium case for your iPad, something that can be used in meetings, or just at casual occasions, this is the case for the job. At £35, it also offers all this at the perfect price.